Once a small fishing village in the southeastern corner of Cyprus, Ayia Napa is now a hotspot for holidaymakers looking for a lively vacation. Over 250,000 clubbers swarm into this party capital each summer and the atmosphere in its scores of bars and nightclubs is nothing short of amazing. Located in the centre of the market garden area of the island, Ayia Napa also boasts a string of superb golden sandy beaches and vestiges of its cultural heritage. There's a Venetian-decorated monastery fronted by a 600-year-old sycamore tree, and a quaint harbour filled with colourful fishing vessels. Just a few miles from Ayia Napa, the resort of Protaras is more restrained and suited to family holidays. 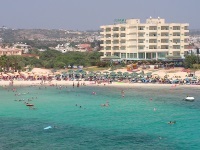 Both resorts have excellent beaches, the most famous being Fig Tree Bay. Other popular beaches include Nissi Beach and Nissi Bay, two miles (3km) west of Ayia Napa; Cape Greco to the east, where the challenge is to leap from the rocks into the sea; and Konnos Bay, just past Cape Greco, where there is a beach café and speedboats for hire. Shopping in Ayia Napa is pure pleasure for locals and holidaymakers alike, with real bargains to be had particularly on designer goods. Top name watches, sunglasses, clothing, cameras, and jewellery are available at cheaper prices than in the United Kingdom. Shops and boutiques are generally small and friendly, opening until 11pm every night except Sundays. The local handcrafts make for good souvenir shopping, including beautiful embroidered Lefkara lace, original ceramic pottery, artistic silver jewellery, baskets, woven and silk goods, and high quality leatherwear. Major credit cards are accepted everywhere. Variety is the spice of life when dining out in Ayia Napa, where countless restaurants specialise in a host of cuisines from around the world: everything from the romantic and traditional, to fast food and pub-grub is on offer. Whether it's a Big Mac or fish 'n chips, Chinese or classic French, you won't have to go far to find it. Visitors are well advised to try the Cypriot fare, particularly in the delightful traditional tavernas clustered around the harbour. Highly recommended is the typical Cypriot meze platter, made up of between 15 and 30 island dishes. Other local specialities include taramosalata, tzatziki, moussaka, stifado (beef or veal stew), afelia (pork and red wine), and loukoumades (doughnuts dipped in syrup). Holidaymakers in the resort soon learn that it's essential to plan an afternoon siesta if they are to make the most of the sensational nightlife for which Ayia Napa is world-renowned. The Cypriots' appreciation for the good life and good times comes to the fore after sunset, with bars, discos, nightclubs, and bouzouki clubs open well into the early hours of the morning. Most hotels have their own nightly entertainment with a resident band, and Greek nights with folk dancing are offered. The resort's clubbing scene is legendary with big name deejays appearing frequently at some of the popular clubs. The extensive, silvery sandy beaches along the coast of Ayia Napa are washed with warm waters that provide a myriad of opportunities for water sports, including water-skiing, windsurfing, sailing, canoeing, pedal boats, motorboats, parasailing, scuba diving, and snorkelling. The Cyprus Tourism Organisation supervises the beaches, many of which have Blue Flag status. Holidaymakers can take excursions from Ayia Napa to places like Ayia Thekla, four miles (6km) to the west with a small offshore island; Makronisos Beach, a cluster of three sheltered bays; or to the historical city of Larnaca, 25 miles (40km) along the coast. Jeep safaris around the island itself are popular, with attractions like the Caledonian Falls and the Byzantine Monastery of Kykkos waiting to be explored. The island's position in the Mediterranean also lends itself to making excursions to other countries and cities, even Jerusalem or Cairo, for a night or two of sightseeing. Generally Ayia Napa is clean, well ordered, and favoured by all types of holidaymakers. Those who do not enjoy noise and bright lights, however, are advised to stay clear of the central monastery square area, which is where most of the popular nightclubs are situated. The main clubbing season is between June and September, and during this period the resort is packed with young people from all over Europe. Older holiday makers may prefer to enjoy the resort during the shoulder months (April, May, October and November), when the weather is still good, the sea relatively warm, but the tempo slower. The island can be windy, but the geographic locations of the surrounding beaches means that it is possible to find a sheltered beach even on windy days. Nissi Beach tends to be overcrowded, but there are other beaches within easy reach where it's possible to enjoy peace and quiet.